Two Kaweco pens that have pleasantly surprised me: on the left, the Kaweco Brass Sport, and on the right, the Kaweco Supra. Check out the patina forming on that brass! Kaweco dominates the “pocket fountain pen” category. While other pen companies dabble in the space, Kaweco is really the only one that's devoted significant resources to mastering it. I’ve tried the full range of Kaweco’s offerings, including some full size models, yet I keep coming back to Kaweco’s pocket pens. 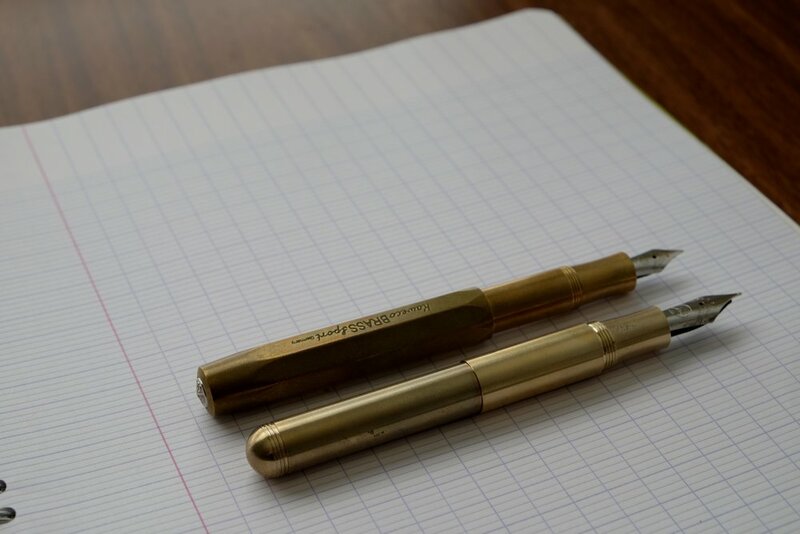 Today, I’m going to take a look at two newer models of Kaweco portable fountain pens in brass: the Brass Sport and the Supra. The modern Kaweco pen company is a relaunch of a classic German pen manufacturer that passed through several bankruptcies and ownership changes before folding in 1981. The company was most recently resurrected by the Gutberlet family in the mid-1990s, and is by all accounts very successful in its most recent incarnation. The Kaweco Sport has driven much of this success, and is itself a reimagining of a classic model of Kaweco pen, though the vintage Sports were piston fillers (which can still be found, but not for cheap). In the past, I’ve reviewed Kaweco’s AL-Sport and AC-Sport pens, which I like, but my favorite Sport model is the one featured here: the Brass Sport. The Brass Sport has the same form factor as the standard Kaweco Sport. It's heavier, but I've found the pen very well-balanced. Much more so than other all-brass or all-stainless steel pens. When they first see the Brass Sport, most people, myself included, worry about weight. The standard Kaweco Sport is plastic, so it’s very light, and AL-Sport and AC-Sport models aren’t much heavier since they’re primarily made from aluminum. But with this pen, the weight doesn’t bother me. Like the other Sport models, because of the shorter length, the Brass Sport is well balanced because it isn't top-heavy. I can comfortably use the pen posted rather than unposted, as I prefer. That said, if you absolutely hate to post your pens, the heftier metal construction makes the Brass Sport more comfortable to use unposted than your typical Kaweco Sport. The Brass Sport also uses the same #4 Bock nib as most other Kaweco pens, so it offers a familiar writing experience. There’s nothing really new to say here with respect to the nib, other than that Kaweco now sells 14k gold nibs that fit the Sport series (sold separately by select retailers). The rumor is that Kaweco will be introducing rhodium-plated gold nibs sometime this year. Shortly after launching the Brass Sport, Kaweco introduced another brass pen, which is a different take on their tiny Lilliput fountain pen. The standard Kaweco Lilliput is so small and light that I can’t use the aluminum version for more than jotting a few lines of notes. 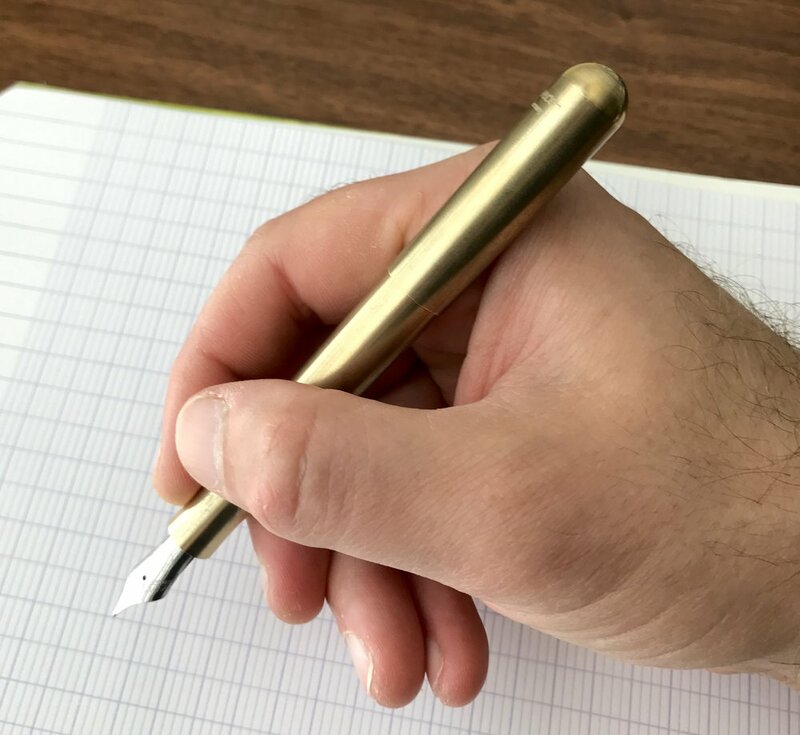 (Kaweco has since issued brass and stainless steel models of the Lilliput, which I haven’t tried but which have garnered excellent reviews because the added heft makes them easier to use for longer writing sessions.) Kaweco’s “Supra” is a larger, all-brass pen based on the Lilliput’s design. The Supra features the same compact, capsule-like shape as the Lilliput, but I found it much more comfortable to use. 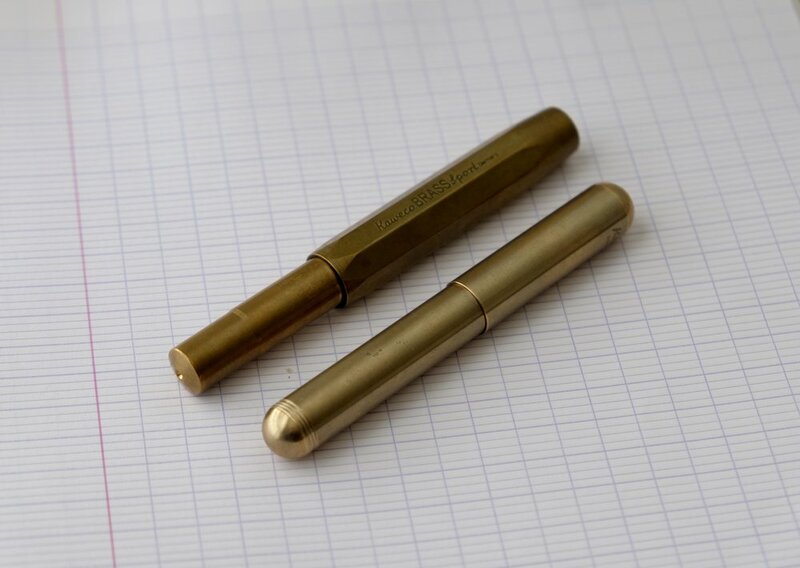 The Kaweco Supra compared side-by-side with the Kaweco Brass Sport. Here, the Supra is in it's "pocket pen mode," making it more compact than the Sport. Like the Brass Sport, the Supra is very well balanced, and I didn’t notice the weight of the Brass much at all. But the best part about the Supra’s design is that you can adjust the length of the pen. Included in the box with the Supra is a small brass tube that you can thread onto both the section and the barrel, turning the Supra from a very small pocket tool into an almost full-length pen. I had fun playing with the Supra at both lengths, but at the end of the day I prefer it without the extender. The longer version was too top-heavy for me to use posted, and for a pocket writing tool I don’t want to have to worry about dealing with the cap. The Kaweco Supra in it's "extended mode". Check out the patina that's developed on the "used" portion of the Supra compared against the unused extender insert. As someone who generally dislikes all-metal pens, both the Sport and the Supra have pleasantly surprised me. I’ve been “on the go” a lot lately, whether traveling for work or family obligations, so much of my writing has been with whatever pen I happen to have with me in my pocket. I’ve come to appreciate these brass Kawecos because you can toss them in a pocket without worrying about whether the pen will get scratched by keys, cracked, etc. - they’re essentially indestructible. The fact that they have some heft also makes them harder to lose, because you’ll notice if the pen falls out of your pocket. While Kaweco nibs can run a bit on the dry side, they are, on the whole, reliable, serviceable writers. The thing that I really like about the Kaweco Supra is that it uses a larger #6 nib. The bigger Kaweco nib is much smoother and has better flow than the #4 nibs used in the Sport series. And finally, a few shots of what I consider the best thing about brass pens: they don’t stay shiny as you use them, but rather develop a patina with age. In my case, it didn't take very long at all. Here's a gallery of some shots that I think show off the patina pretty well. I purchase almost all of my Kawecos from Pen Chalet, which stocks the full range of Kaweco products at great prices. The Brass Sport retails for $100, and the Supra retails for $140. While certainly not inexpensive, these prices are consistent with the pricing on other all-metal brass fountain pens. Disclaimer: The pens featured in this review were provided to me free of charge for review purposes. Many thanks to Kaweco for allowing me to try out the Supra, and to Pen Chalet for sending me the Brass Sport.